A high quality vegetable protein powder made from organic sprouted and fermented raw wholegrain brown rice protein. The perfect basis for protein drinks, smoothies and shakes, and ideal immediately before or directly after exercise. Organic Sprouted and fermented Raw Whole Grain Brown Rice Protein, Vanilla Extract (6.0%), Xanthan Gum (E415), Stevia Glycosides. nut milks, rice milks or juices. Conscious consumers are increasingly choosing for pure vegetable protein powders that are totally free from animal products (including whey). Superfoodies brown rice protein powder is made from organic sprouted and fermented raw wholegrain brown rice protein, and manufactured at low temperatures using a natural biological enzymatic process, without the use of chemicals or acid hydrolysis. Superfoodies brown rice protein powder contains all nine essential amino acids as well as numerous non-essential amino acids in an optimal ratio. The high quality protein powder is additionally rich in vitamins (e.g. Thiamine, riboflavin and niacin), minerals (e.g. Phosphorus, iron and potassium) and the antioxidants, tocopherol and tocotrienol. 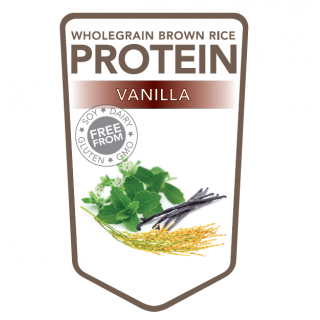 Rice is regarded as the most hypoallergenic source of protein, which means that Superfoodies brown rice protein powder is not only the ideal choice for those following a vegetarian, vegan or rawfood diet, but also those with food allergies. Add 20 grams or one scoop of Superfoodies brown rice protein powder to 250 ml of water, juice, almond milk or rice milk. Stir thoroughly and drink immediately. 95% of protein powders contain unhealthy additives, including refined sugars (such as aspartame, sorbitol and saccharin), soya, non-organic eggs, wheat gluten and preservatives. Superfoodies brown rice protein powder on the other hand is made from a highly absorbable source of vegetable protein, is completely free from artificial additives and has been sweetened using the natural superfood sweetener, stevia. 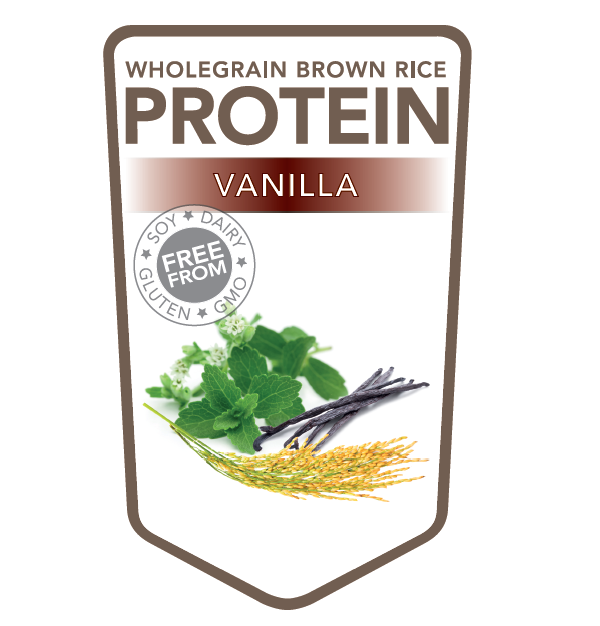 Superfoodies brown rice protein powder is available in 4 irresistible flavours - natural, vanilla, chocolate and banana. Organic sprouted and fermented raw wholegrain brown rice protein, vanilla extract, xanthan gum, stevia glycosides. There are no known side effects associated with Superfoodies brown rice protein powder. This product is not suitable for use as a meal replacement or as an aid to weight loss. Women who are pregnant or breastfeeding must not exceed the recommended daily dosage and should also obtain protein from additional sources. Not suitable for children under 2 years of age. Children aged 2 years and upwards can consume a small amount of Superfoodies brown rice protein powder, one to three times a week. If in doubt, always consult your GP before deciding to order Superfoodies brown rice protein powder.